Authorities now have a seven-day deadline to explain why they fear that the ongoing investigation may be harmed if the files are opened to public scrutiny. 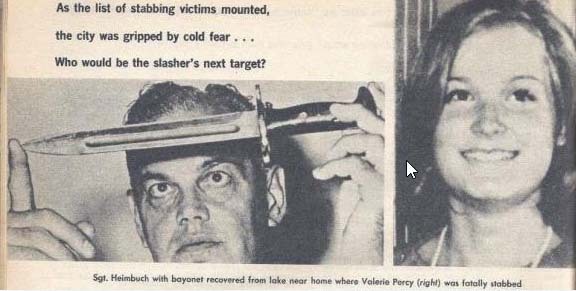 On September 18, 1966, Valerie Percy (21) was murdered in her parental home in Kenilworth, Illinois, by an unknown intruder. Her case remains unsolved. Valerie was the daughter of former senator Charles Percy and Jeanne Valerie Dickerson. The attack on Valerie was intense and suggests a personal attack. The cause of death was a fractured skull (left side) and 14 stab wounds. Valerie Percy’s murderer left five bloody palm prints on the banister and a black leather glove outside the mansion. If properly preserved, the glove should be treated with the M-Vac System for touch DNA. The killer also left footprints at the Percy home leading to the beach. Three days after Valerie’s murder, police found a bayonet in Lake Michigan (see photograph above). In 1966, none of these dots were connected. I have posted my concerns with this case in this post. As you can see from the length of it I have many concerns. “John Kelly, the lawyer who is behind the fight over the records, said in a sworn statement that he does not represent any potential party in the case but is pursing his own inquiry as a former prosecutor who is now a civil litigator. One of my readers pointed out that one of the biggest questions to be answered center on the murder weapon. The author Wall claims that authorities believe the weapon used to kill Percy was serrated. The bayonet that the police say they found in Lake Michigan (see picture) is not. Which is it? The autopsy report should be able to answer that if we look for the full description of Valerie’s wounds. Judge Anna Helen Demacopoulos gave them seven days and scheduled a ruling for October 17, 2016.